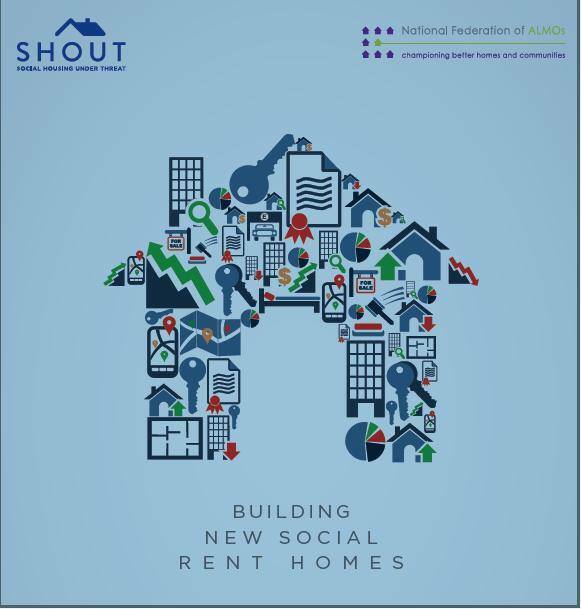 SHOUT, the campaign for social rented homes, has stolen a march (together with the National Federation of ALMOs) by commissioning the global macroeconomic research company Capital Economics to undertake independent research into the fiscal and economic case for building 100,000 new social rented homes each year. This was inevitably something of a risk. Could the case for a major programme of building social rented homes be made under rigorous scrutiny and analysis? SHOUT’s core argument – that a major programme of new social rented homes offers not only the best housing solution for people on low incomes but would also be beneficial for the wider economy, reduce the requirement for housing benefit, increase work incentives, and be positive fiscally – needed to be tested in a robust way. The key question: should building 100,000 new social rented home a year not only be a flagship housing policy but also a central component of the Long Term Economic Plan? The Capital Economics report, published today, is unequivocal. ‘The economic and fiscal case for building new social rent housing is unanswerable’. If the trends over the last Parliament were to continue into the future – building almost no social rent, a modest amount of ‘affordable rent’ and becoming increasingly reliant on the private rented sector to house people on low incomes – ‘the overall bill for housing benefit is set to accelerate – worsening the government’s structural deficit now but also into the longer term’. The trends, say CE, are unsustainable, as the cost of housing benefit (UK) can be reasonably projected to increase from around £24 billion today to almost £200 billion a year by 2065-66, with households in the private rented sector accounting for 63% of the total, up from 37% today. Building 100,000 social rent homes would reduce public sector net debt as a share of gross domestic product – the holy grail of the Chancellor. A long time frame? Certainly, but this is the horizon for the Office for Budget Responsibility’s long-term fiscal projections. And the point of a Long Term Economic Plan is to make decisions that are, well, long term. ‘Investment in new social rent housing offers a solution that is fiscally sustainable and economically efficient’. CE make the key point about social rent: it requires both investment, financed by private borrowing, from social landlords, underpinned by a level of upfront contribution from the state. Once built, the servicing of the debt, management and maintenance of the properties and other costs can be covered by rent. Once built, no further subsidy is required. Over an even longer time scale – as homes have to last for even longer that the debt – the homes make a return. ‘A social asset is created which will endure for decades, if not centuries’. Not only does the equation work in terms of the fiscal trade-off between bricks and benefits, it also works as an economic stimulus. Each pound of investment is estimated to stimulate an extra £2.84 of economic output through the supply chain and the extra spending of employees. Each £1 would stimulate an additional 56p of new tax revenues for the exchequer. It would also have other beneficial knock-on effects that are harder to estimate and have not been included in the fiscal arithmetic. They note savings that could be made due to improvements in health, well-being, education and energy efficiency. They note possible improvements in policy towards children, due to the security of having a stable home, and to older people, who will have the greater possibilities of living in a suitable home rather than expensive residential care. CE model the effects of building up gradually to 100,000 social rent homes a year by 2020-21, to enable the commissioning agencies, the construction industry and the supply chain to adapt. So where is the down side? At the start of the programme, the welfare savings and new tax receipts will be less than the money needed in grant to fund the new homes – so initial additional public borrowing is required. CE estimate that this would peak in 2019-20 at no more than 0.13 per cent of GDP. The policy would be creating a net surplus to the public finances by 2034-35. Taking a long term approach to controlling the deficit would, say CE, be welcomed by financial markets. The report can only be briefly summarised here. It has a wealth of detailed material and many sophisticated calculations to demonstrate the case. It can be pored over by other macro-economists and fiscal experts. But it will become the core text for all of us who care about housing and want a balanced housing policy that encourages both sustainable home ownership and high quality affordable renting. Housing policy is off the rails; it is totally ineffective whilst at the same time being hugely expensive. ‘No direction home’ as Bob Dylan would say. There is a solution. I have waited 30 years for the case to be made as well as it is in this report. Just a little political bravery could put us on the genuine path to solving the housing crisis in a generation. It is a policy that could be adopted by any and all political parties because it works, fiscally, macro-economically, and in social policy terms. Because, as Capital Economics say, the economic and fiscal case for building 100,000 new social rented homes a year is UNANSWERABLE. The report can be downloaded in pdf form from the SHOUT website.